Everyone loves a comfortable pair of denim jeans. Jeans are a staple in international fashion apparel. It seems the older your favorite pair of jeans get the better they feel. Jeans are as functional as they are stylish. There is no limit to the use and style variety of the denim jean today. 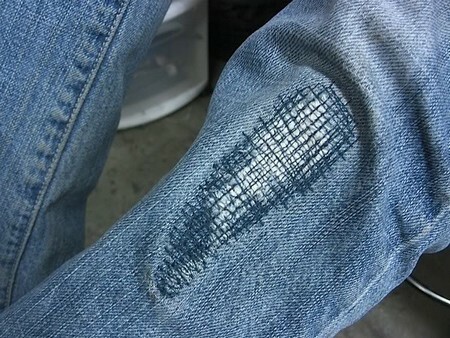 Holes in denim doesn’t necessarily mean the jeans are not repairable or wearable. You don’t have to put them in the trash. Instead, you can repair the hole in your jeans and keep them for your next fashion statement. Set up your sewing machine by threading it with any color and weight of thread you choose. We will be using a patch to repair the tear in the denim. So, if you wish to make the patch unnoticeable then match the patch with the color of your actual jeans. Choose your patching material. Denim is the optimal. It blends well with your jeans and is very durable. There are other options you may also choose from. You may choose to use an iron on fabric. Measure the patch size by sight and cut out enough fabric to completely cover the hole with a little extra around the circumference. Turn you denim jeans inside out. You want to securely attach the patch tot he denim. If you are using an iron on patch, iron the patch on according to the instructions. If you are using a fabric patch then pin the denim patch in place on the inside of the hole. Take care not to place the pin through the entire space. You want to pin one layer of fabric. Load the fabric on to your sewing machine. Lower the needle to secure the fabric before you start. Begin to sew around the edge of the patch. This will secure the patch permanently to the inside of the denim jean. Sew around the edge of the patch. This will attach the patch to the jeans permanently. Reverse the jeans by turning them the right way. Inspect the job you did sewing or ironing the patch on. If the hole is covered then this is your last step. If the hole is still too big you’ll need to close it. Use a horizontal or vertical zigzag stitch to close the rest of the hole. Make sure the stitch is on the patch for added security. Re evaluate your work. If the hole is now close, then the job is complete.